cs_wolf updated the task description for T122108: Apples glitch. cs_wolf created T122108: Apples glitch. cs_wolf added a comment to T121647: [0.61 EXP] Permanently unconscious; unable to be revived.. I went uncon. then got up, bandaged, ran for a bit then game crashed, I log back in and fresh spawn, dont know if linked as server might thought I was still in uncon state and crash killed me as the uncon punishment does. cs_wolf added a comment to T121549: Loot on 0.61 experimental still broken [same items]. I confirm this, Its a big deal to me and really hope it gets fixed for stable. cs_wolf created T121543: RV1 RDS Optics. cs_wolf updated the task description for T121523: Hearing VOIP after death and respawn. cs_wolf created T121523: Hearing VOIP after death and respawn. cs_wolf updated the task description for T121522: Muzzle Flash. cs_wolf created T121522: Muzzle Flash. cs_wolf added a comment to T121508: Severe Server Desync after Latest Experimental Patch. I can confirm this, I had it very bad last night, rubber banding with zombies, they stuck me in a room, could not get out, kept rubberbanding back to where they stuck me in the house and kept hitting me, then someone saved me. Then when moving with players I rubberbanded around them too. The barrack doors let zombies through when closed. Just a lot of rubberbanding. Server was UK 0-4 for me. cs_wolf created T121502: Heat Status. cs_wolf updated the task description for T121208: EXP Wolves. cs_wolf added a comment to T120676: Binoculars. Not possible, as the click to the zoom is like input lag from when I click the mouse button compared to not having binoc's in hands. cs_wolf updated the task description for T121486: DayZ Barn loot. cs_wolf created T121486: DayZ Barn loot. cs_wolf added a comment to T121452: Can't hear the distance shoots anymore? . I can confirm, did not hear the first gunshot from enemy as he hit me, then I heard the rest. I noticed the bug from the latest EXP update, some gunshot sounds not being heard and naked players in distance about +200m, the previous EXP patch was good tho. Tested on EXP, still happens but its a slight difference to not having binoc's in hands, seems more laggy. cs_wolf created T121208: EXP Wolves. cs_wolf renamed T121130: EXP AKM Recoil is to much from AKM Recoil is to much to EXP AKM Recoil is to much. cs_wolf created T121130: EXP AKM Recoil is to much. cs_wolf updated the task description for T121027: Graphical glitch. cs_wolf added a comment to T121027: Graphical glitch. cs_wolf renamed T121027: Graphical glitch from Graphical glitch *FOREST GRASS ONLY* to EXP Graphical glitch *FOREST GRASS ONLY*. cs_wolf created T121027: Graphical glitch. cs_wolf updated the task description for T121017: DayZ Experimental *INGAME* Crash. 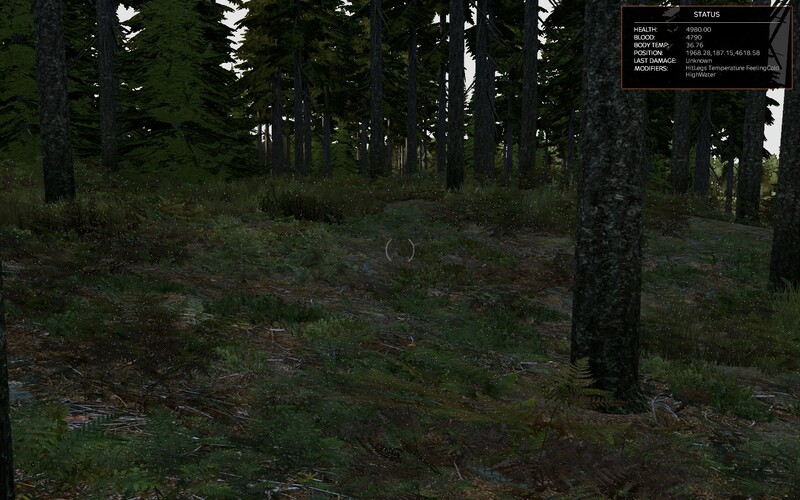 cs_wolf added a comment to T121017: DayZ Experimental *INGAME* Crash. cs_wolf created T121017: DayZ Experimental *INGAME* Crash. cs_wolf created T121015: You can shoot through *NEW* barracks wall. cs_wolf updated the task description for T120979: EXP server UK0-4. cs_wolf created T120979: EXP server UK0-4. I tried to test on experimental but the fps was lower than 0.60 and coudn't test the binoculars second bug. cs_wolf removed a watcher for DayZ: cs_wolf. cs_wolf added a watcher for DayZ: cs_wolf. cs_wolf created T120779: Is this the case with DayZ?. (Second bug) Same happens with hunting scope. Maybe happens with all scope types. I only play 1st person, I was playing on a forced private first person server. So in regards to third person view I dont know. cs_wolf added a comment to T120002: *HUGE GAME BREAKER* Server Rolls Back to Last Login Upon Restart. Side note- after the restarts vss and ump's spawning in civilian houses in lopatino? DayZ Underground EU has reset 2 times in the last 20 minutes, rollbacks and vybor spawns. And again 12:53 same server, NO rollback or gear reversion. Happened again, restart / crash dont know. DayZ Underground EU server, August 22 2016 12:41 Rollback to last log out position + gear reverted. Rolled back to last log out position + all gear was reverted too. HUGE gamebreaker bug / hack. cs_wolf added a comment to T115770: While leaning the player will suddenly run out of breath and recoil backwards as if fatigue has reset. I too submitted this bug a while back. It got assigned but I did not recieve any info in the tikets comments. I too had proof (One of breaks vod's) but the vod expired. Please use sacriels video and the comment above me video as proof. cs_wolf added a comment to T115748: Loot spawning/central economy seems to spawn a handful of items everywhere. cs_wolf added a comment to T115730: SVD will remain suppressed when improvised suppressor has been ruined..
A must fix! Not hearing any shots from the deadliest ammo type and SNIPER weapon in the game so far is super silly! Side note - I dont think its just the SVD. Test all guns devs. cs_wolf added a comment to T115727: Battle-Eye / MOTD ruining content created by content creators. Would be interesting to get updates in this ticket on what / how the NewUI programmers are planning to implement it. This is a must. Cripples youtubers and streamers hard work. Be it an entertaining video on youtube or a hard working streamer enjoying the game with his/her viewers. Making BattleEye messages admin view only and MOTD toggled in client options would be a possible solution. cs_wolf set Category to category:general on T115406: 0.59 Stable Bug - White hands. cs_wolf added a comment to T115296: Cant loot bodies. cs_wolf added a comment to T115156: Rubberbanding every 20-30 seconds or so.. Same happening to me on 3 different UK servers. cs_wolf set Category to category:general on T114837: 0.59 - Smoke grenades. cs_wolf set Category to category:playerstuck on T114375: Stuck in house in berezino. cs_wolf set Category to category:featurerequest on T114225: Pumpkin seeds. cs_wolf added a comment to T114155: Fence through house in Bor. I have seen this too, a yellow house. Next to the two pumps next to each other. cs_wolf set Category to category:gamecrash on T114153: Game Crash while ingame. cs_wolf set Category to category:animations on T114145: Double gunning. cs_wolf added a comment to T114109: Wring Clothes. Yes, my character status was drenched. When I took face mask and hat off my character, the character status would go one down from "drenched" to "wet", but when putting them back on it would go back to "drenched". The wringing did not take effect. cs_wolf set Category to category:items on T114109: Wring Clothes. cs_wolf added a comment to T114047: Items spawn below surface and inside ech other in new military barracks. I too have experienced this a few times. cs_wolf added a comment to T114025: Controls: Raise weapon/Toggle raise weapon.. I too have problems with raise weapon conflicting with right click to iron sight, got me killed once, I got confused if I should press the raise weapon button or right click and it messed up my combat. cs_wolf added a comment to T114014: Stable / Experimental. I can still join the Stable server. cs_wolf set Category to category:general on T114014: Stable / Experimental. cs_wolf added a comment to T114010: ATC Tower glitch. Geez I have something that might help.